Alan Haley posted this query about his 1958 Jeep on on the CJ-3B Bulletin Board: "I am working on the front brake lines and tried to order a 10-inch hose that goes from the frame to the fitting on the inside of the wheel. The Turner guys say that this is wrong, should be a 6-inch hose that attaches to an 'S-line' that is attached to the inside fitting on the wheel. They say this is to prevent a hose from fatigue due to constant flexing when wheels turn. Is this 'S-line' really neccessary or is the 10-inch hose an acceptable connection?" Mike B. confirmed the Turner information: "I just finished reworking a '50 CJ-3A and the 'S' line is very much present. I looked at a '53 CJ-3B and it has it too. The '50 and the '53 are both more or less original. The guys at Turner are very experienced and it's rare that they would make a mistake like that. I found the 'S' line in the parts catalog too." 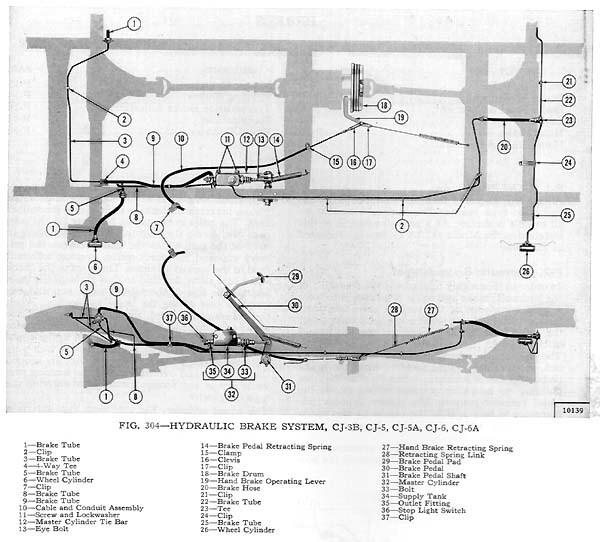 See the illustration at left from the 1956 Parts List, showing the "S" line (#22). 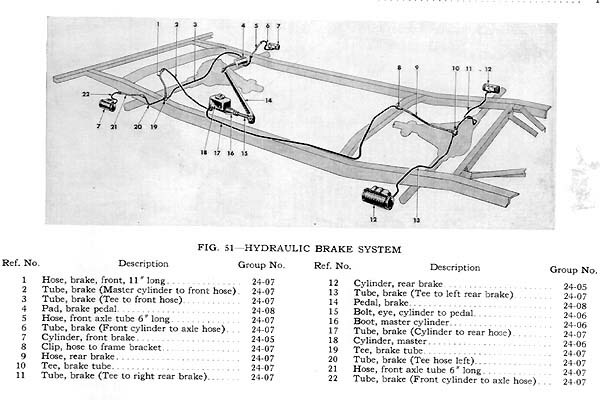 See also the 1956 illustration of the whole brake line system (50K JPEG). Derek Redmond noted: "The 'S' tube between the cylinder and the hose is shown in my 1956 parts book, but not my 1965 Service Manual. I used the 11" hoses when I redid the brakes in my 1959 3B ten years ago, so I assume the "S" tube wasn't in there originally either. And the hoses don't show any wear and tear from flexing or touching the knuckle." 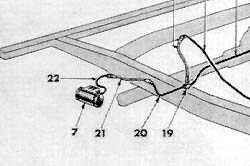 See the illustration at left from the 1965 Service Manual, without the "S" line. 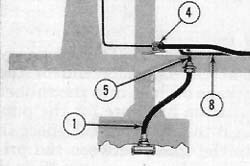 See also the 1965 illustration of the whole brake line system (50K JPEG). Ron Ingram confirmed: "The tube is not shown or listed in my parts manual dated February 1962. It is not present on my '61 3B." And Doug Anderson says, "My '60, which was the last one built in 1959, does not have the 's' brake lines. It has the angled hole on the wheel cylinder with the hose from cylinder to frame." Any further information about when the change was made from the "S" tube to a longer flexible hose, between 1956 and 1959, is welcome. Curtis Weddle inquired on the CJ-3B Bulletin Board: "Any words of wisdom on rigging brake lines? Regular steel? Is stainless available?" Reed Cary commented: "All your options are open, from buying pre-fab lines to doing it yourself. Should you go the route of doing it yourself, I would suggest you think of buying the most difficult to self-reproduce parts, such as the little 'S' curves on the steering knuckles (unless you really enjoy such challenges). You will need a 'double flare' tool, and also generic brake line lengths, available from brake specialists." Joel Kamunen recommended thinking about buying lines pre-cut: "I believe Walck's sells the brake lines in the correct lengths. Time vs. money. The auto parts stores sell brake lines in generic lengths, i.e. 6"-8"-10" etc., but for a much cleaner looking job the correct length lines would look nicer. You could make your own if you have the time." Sam said go for it: "I don't believe there is stainless brake line, but I may be wrong. I think conventional flaring tools would not make the double flare properly on stainless. As for making the brake lines yourself, I did my CJ-2A and my TR3A in about an hour or two. Just go to a local auto parts store and buy a length of brake line about 25 feet, and the fittings, in my case 14, and with a good flaring tool and small pipe cutter you're set." John Sodia added: "I've done numerous brake lines, custom brakes, and disc brake conversion and would have to say that if you have a knack for precision, doing the job yourself is best. It's not that difficult and you can make your brake lines fit exact, clean and tight. The right tools are necessary. Flaring tool, small tube cutter and small tube bender." Jyotin advocated caution: "Whoever said to buy the 'S' lines from someone else was dead on. Life is too short to attempt that one. Easiest way I've found to put in the 'S' lines is to loosen the wheel cylinder and get everything started because installing the 'S' line with the wheel cylinder locked down in place is a frustrating task. Be sure to form the 'S' line to ensure it does not rub any of the other hardware. Making the other lines isn't difficult, but remember that you have a single master cylinder, and if a line pops you have no brakes at all. If you do not feel competent to make the lines, either buy prefabricated lines or have it done by someone else who can do it right. Don't forget to replace all of the 40 year old rubber flexible lines -- the system is only as strong as it's weakest link. Discretion is the better part of valor. Jim Sammons was going with stainless: "I am currently re-building my 3B and have access to stainless steel tubing. I plan to build the system out of 1/4 inch stock. You have to have the reverse flare adapters that screw into the wheel cylinders with the other end being 1/8th inch NPT, then connected with 1/8th inch collar to a fitting that goes from 1/8th NPT to the farrel type compression fitting on the stainless line. I can tell you that the stainless fittings are very expensive, and if I weren't getting them for free I probably wouldn't do this. However the cost may be worth it because I can't think of a more rugged and good looking alternative." Mike mentioned he coldn't find a source for 3B steel brake line kit: "I have a '62 CJ-3B. I'm replacing the entire brake system. While shopping, it seems no one makes a steel brake line set specifically for a 3B. I was told by Turner that a CJ-2A/3A set would fit so I bought it. Not even close. Then I purchased another set from Walck's that was for an early CJ-5. This set was closer but not correct. It also didn't come with all the hardware like the previous set. I finally went back to the original company and purchased an early CJ-5 set from them. It was close enough and came with all the brackets. Cheaper too. I had to re-bend the rear two lines. They were a mess but the length was correct. The hardware in the 2A/3A kit was more correct than the one in the early CJ-5 if you are a stickler. The rear clamps around the rear axle on my '62 CJ-3B are a slip on semi-circle with a small kink in it to accept the brake line. The CJ5 kit were hoseclamps. Conclusion: early CJ-5 lines, CJ-2A/3A hardware. I don't think you can buy it that way though." Bob Christy: "I bought the flexible brake lines from M&M 4x4 Center here in Ohio and made the steel lines myself. I also bought the little "S" curves from them for $3 each...well worth it. I think I have about $40 in all of it." Ernie: "I bought my flex lines from a local 4x4 supply. The steel lines I ordered from Classic Tube, 800-882-3711. They made up all of the lines to the lengths I gave them over the phone. I bent them myself and they look and fit like new. The cost was $30.52 for all the steel lines including shipping." Chet: The problem I am having is, I'm trying to replace the brakeline from the master cylinder to the brass "4-way" mounted to a bracket located on the frame. Needless to say I have rounded the nut, sprayed with W.D., used vise grips, etc. and I can't get it to budge!" Eric Lawson: If you must replace the tubing, or don't feel comfortable leaving it alone, about the only thing I can think of at this point is 'overwhelming force with the vice grips.' Make sure the fitting is held in place with another wrench so the fitting doesn't become damaged. If you are fighting the fitting that I think you are fighting, then you don't have much room to work. You might get a smaller set of vice grips so that you have more room to move the vice grips. Another possibility is to grind smooth a couple of flats on the rounded nut and attack it with a good tight adjustable wrench. The adjustable wrench is less likely to spring open. When using a regular flare nut wrench on brake line nuts and it looks like I will end up rounding the nut, I put a set of vice grips on to the flare wrench's jaws to help prevent the flare wrench's jaws from springing open. The tightness of the vice grips is enough that they snap tightly into place, but not tightly enough to bend the jaws ofthe flare wrench." Steve: "If all else fails, and you have the room to do it, try sawing the remainder of the line off flush with the flare nut and tap an easy-out into the hole. Gently tighten the easy-out into the sawed-off line and it will expand into the flare nut and eventually something will give. Best case, the fitting will back out. Worst case, the easy-out will snap off and the 4-way fitting will become useless. But it's useless to you now anyway, so go for it! As for using WD-40 for penetrating oil, I have found it to be near worthless for this. Try something that is a true penetrating oil, such as KROIL or PB-Blaster. WD-40 is more for displacing water, or use as a light lubricant than penetrating. A good penetrant makes ALL the difference in the world! P.S. Try resoaking and then removing the rest of the lines from the fittings. You may be pleasantly surprised that they will come loose, allowing you to get that fitting out in the open where you can really work on it!" Eric Lawson: "Make sure, after using penetrating oil, to clean the brake lines with brake cleaner or alcohol. Oil inside the brake lines is bad......"
Chet: "SUCCESS! The combination of the PB Blaster, a little heat and 200 attempts with the vice grips, and it broke free last night." 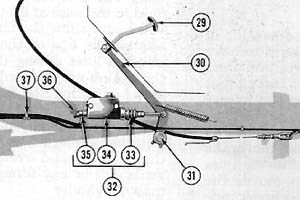 Scott Blystone asked on the CJ-3B Bulletin Board for input on a problem many of us have had: "My brake pedal wiggles side-to-side, I assume due to normal wear. The Service Manual mentions a repair kit to corrrect this. Can anyone tell me how to do it, is the kit available anywhere? What has anyone else done?" Jim Sammons answered: "Sometimes the sideplay can be fixed by removing the pedal arm from the pivot shaft down on the frame and then wrapping the pivot shaft with brass shim stock if there isn't too much wear. You can get shim stock in varying thicknesses from almost any auto supply store. While this repair won't last forever it's cheap and easy to do. While you're there don't forget to grease the clutch and brake pivot arms. Lack of grease is why they wore out in the first place." Tony Morreale suggested a couple of parts sources: "You might want to try Turner 4WD (800-the-jeep) or Beachwood Canvas (732-929-3168). If they don't have the kit, I bet they've both got the individual parts to fix the play in the pedal." Joel Kamunen added: "Walck's has part #A-495 (cross tube, brake pedal) and part #800527 (brake pedal) listed as the parts you need to replace. You could also build up the shaft by brazing it and then fitting it to the brake pedal hole. The brake pedal is long and it doesn't take much slop between the brake pedal and the shaft to create side play. With 9" brakes there has probably been a heavy foot on the brake pedal at times." Chris Henry commented: "I feel pretty lucky; I bought a new shaft from Carl and had a local supplier that rebuilt the pedal lever. It's as good as new. I don't remember what it cost, but it wasnt too bad." See details on the Willys Slack Adjuster Kit on The CJ-3A Information Page. Note: steering and brakes on your vehicle are critical to life safety. The information on this page is general in nature; if you are uncertain where your problem lies or how to correct it, get professional advice.